Pantothenic Acid 500mg 100 caps. The product is recommended in particular to supplement the deficiency of vitamin B5. It has been observed that pantothenic acid helps to alleviate acne. It can be recommended to people with skin problems for a faster recovery, and may be beneficial in the case of wounds and burns. 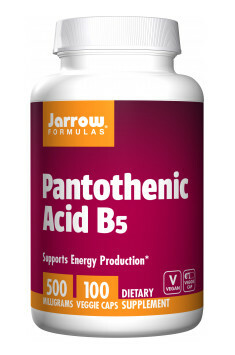 High doses of pantothenic acid are very well tolerated by the body, but in some cases may cause diarrhea. Dietary supplement with OptiMSM. Inhibits the development of inflammation and pain.